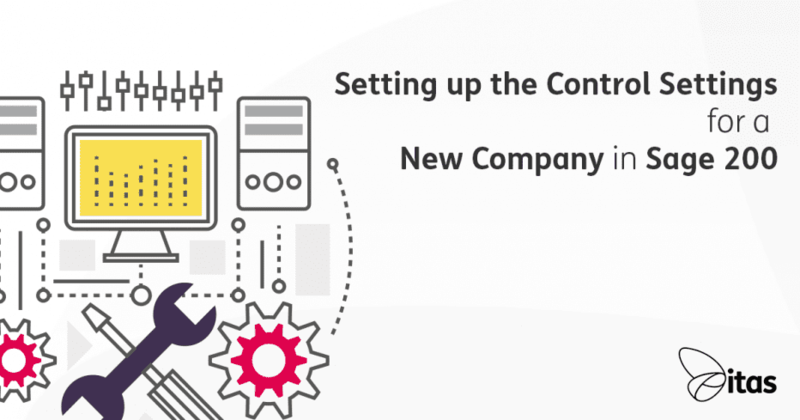 When setting up a new company within Sage 200, there are be many settings that need to set up in order for it operate how you need it to and to ensure the sound management of the business’s finances. Below is a summary of the settings that need to be looked at before you enter any new accounts or transactions. There are two different elements of control settings… 1. For the company as a whole and 2. Specific ledger controls. Setup the basic company details name, address and contact details along with information regarding VAT. This is important, as this is the information that will populate layouts, letters, and reports within the company. Operational settings – Set the number of accounting periods allowed open at one time, date of the next VAT return and how certain entries are treated. Invoice and credit notes – Setup of invoice and credit note numbers. Transaction settings – Any headings required for analysis. You can also setup transaction date validation to control whether entries dated in a certain time period can be entered into the system. You can set up different VAT rates for different types of services or products. You can also assign whether each is included on the VAT return and which nominal code these are posted to. Exchange Rates – Setup of the currencies used and the exchange rates between your base currency. Settings – How the currencies interact, whether they can be amended and whether they are used for new accounts. Setup of the accounting periods for the company (current and future) and whether they run on a monthly or 4/5 weekly cycle. Status of a period (open, closed or future) for each ledger and element affecting the nominal ledger. 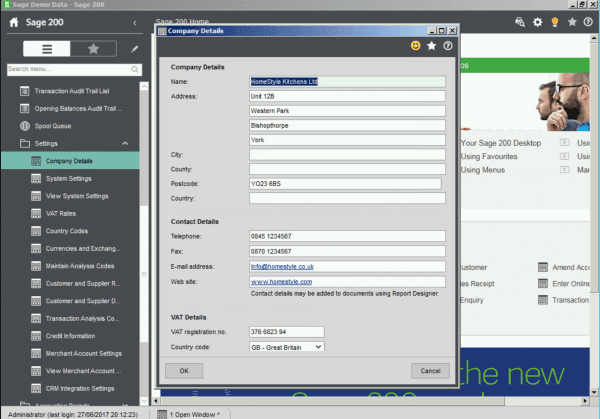 Options – Configuration for account creation and enquiries. Defaults – Whether you want to be able to post to a previous year or keep aged transactions, length of time to keep them and if you want to archive them after this period. Budget Headings – Add names for your budgets. Budget Profiles – Enter the budget for the year and what percentage of the budget you want to allocate against each financial period. VAT Submissions – Setting up online VAT submissions and details for HMRC. Whether a specific nominal code should run through to the profit and loss or the balance sheet. Without having these set up correctly many transactions will post to your suspense account. Whether a certain nominal code will run a report as a profit and loss item or a balance sheet item. Options – Do you want to allow electronic bank payments, batch processing, automatically generate supplier numbers and allow additional transaction analysis. Supplier Defaults – Settlement discounts, Account history, VAT codes, and terms agreed. Ageing – Setup of the default payment terms. Processing – Revaluations based on a foreign currency and invoice authorisation limits. Payment Groups – Setting up payment methods and what documents are produced. Options – Whether you require copy statements for head office, do you want to allow batch processing, automatically generate invoice numbers and card processing. Customers Defaults – Settlement discounts, Account history, bad debt recovery, VAT codes, and terms agreed. Ageing – Setup of default payment terms. Processing – Foreign currency revaluation, statements and finance charges. Finally, once you completed all of the above before you enter any transactions into the new company, give all of the newly setup controls a once over to ensure that they are set up as you expect and there are no errors. Take caution when entering your first account in each module and each transaction in each module to ensure they have been posted as expected. Still wanting some assistance? Why not get in touch with one of our friendly team, we are always happy to help! Don’t miss the Sage 200 Buzz Newsletter! Here at itas, we send out a monthly Sage 200 Newsletter. Packed full of hints and tips, content and more to help you streamline your processes. Click here to sign up, or the banner below.